My ninth ground of 2016 was on Monday 16th May at Parken in Indre Østerbro, Copenhagen, Denmark. The match was Copenhagen vs. Nordsjælland in the Danish Superliga. 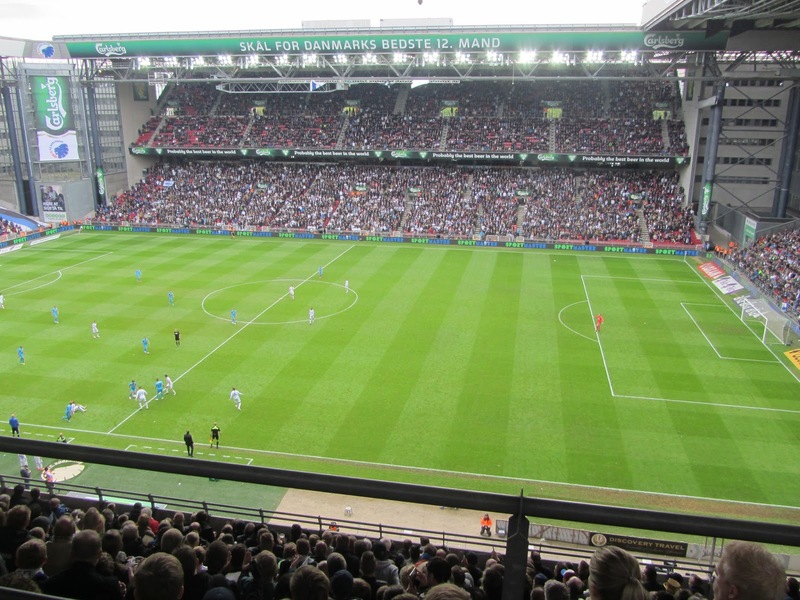 The stadium is part of a sporting complex which lies adjacent to the Fælledparken green space. 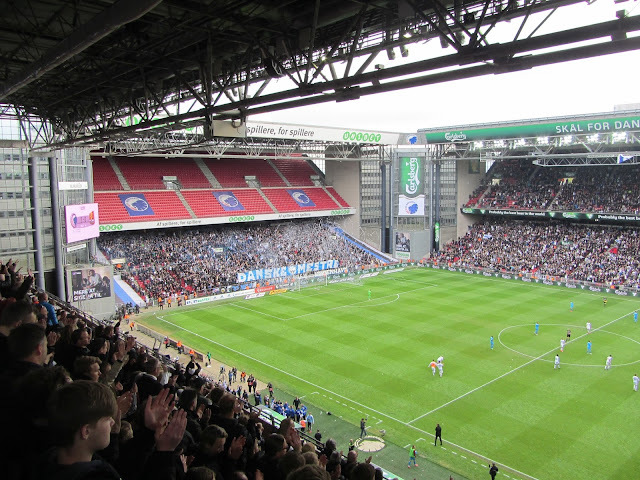 Parken is the largest of two stadiums in the area with the 7,000 capacity Østerbro Stadium sitting next door playing host to two smaller Copenhagen sides. The venue is one mile west of Nordhavn railway station and has been home to Copenhagen since it was constructed in 1992. Parken was built on the site of the former Danish national stadium of Idrætsparken which was in use between 1911 and 1990. Completed in 1992 the venue became the new home for Copenhagen and the Danish national team. It has a capacity of 38,065 for football but this can be increased up to 55,000 for concerts. 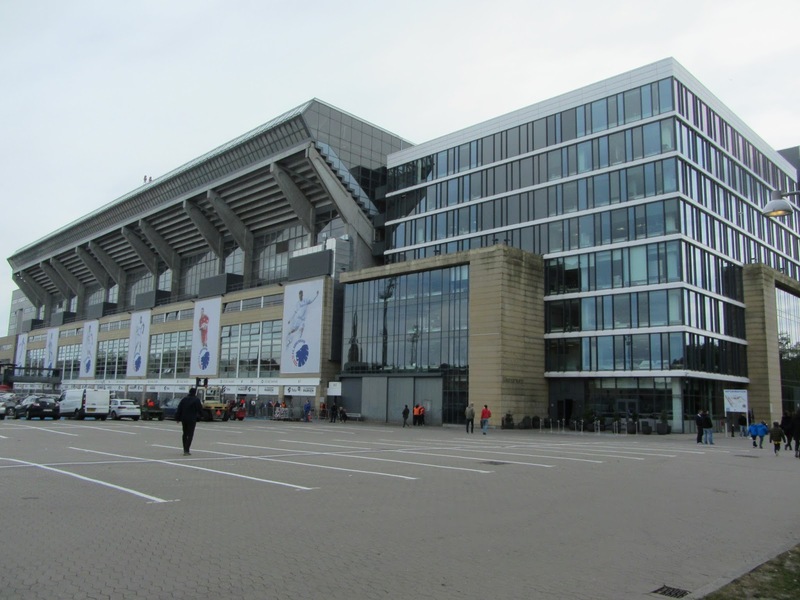 The stadium has also played host to handball and the Danish round of the Speedway Grand Prix world championship. The east and west stands hold the largest number of supporters - the two run alongside the pitch and are almost mirror images of each other. Both are two tiered stands with a strip of corporate boxes separating the two tiers. The East Stand is considered the main stand and contains the dugouts and dressing rooms. The other two-tier stand is behind the goal at the southern end of the stadium. The lower tier is given over to the more vocal home support with a minimum age limit of 15. 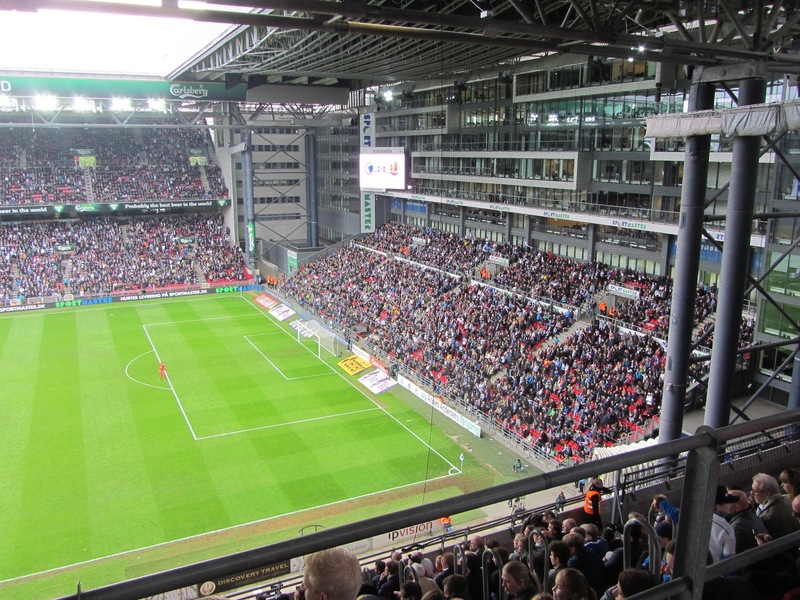 The northern end of the ground is the only single-tier one at Parken. Above the single tier of seating are several glass floors of offices and hospitality areas which means the stand is of roughly the same height to the other three. All four stands are separate in so far as none of the four corners are filled in with seating. This ensures the venue retains a compact feel. These corners hold a variety of facilities - the north-east corner containing offices and a restaurant, the north-west corner having a cafe and the club shop, the south-west including a gym and the south-east housing a fan club. Copenhagen went into the match knowing a win would be good enough to secure them the Danish Superliga title with a couple of games to spare. They went close to opening the scoring in the 9th minute when a shot from Youssef Toutouh from the edge of the area curled just wide, hitting a stanchion behind the goal. In the 23rd minute they went close again when a corner was cleared as far as Peter Ankersen who drilled a 30-yard shot through the pack of players only to see his effort palmed away by David Jensen. Despite being well on top it was 0-0 at the interval and the hosts continued the second half in similar attacking form to the first. It was all Copenhagen in the opening passage of play and their banging on the door finally paid off in the 63rd minute. Benjamin Verbic picked up the ball and advanced towards the area before laying it off to Federico Santander who, with his back to goal, turned and shot low from 18 yards into the bottom corner of the net. The home side doubled their lead in the 67th minute. Again it was Verbic and Santander linking up with the former making good work down the right wing as he skipped over a sliding tackle before crossing low for Santander to poke home on the line. It took until the 80th minute for Nordsjælland to finally test Robin Olsen in the home goal. However by that point it was too late and the visitors, on a poor run of form, slipped to another defeat. Celebrations could start as the final whistle went confirming Copenhagen's 11th Danish Superliga title. Plenty of fans stayed to enjoy the occasion and applaud the players on their lap of honour.